Our gardens and green open spaces are green corridors within the hustle and bustle of buildings, roadways and today’s hectic lifestyles. These “green corridors” can be a haven for bees and butterflies and not only can we enjoy the beauty and flower interest of shrubs, they can be attractive to wildlife, too. We’ve a few buzzwords(!) for you to encourage bee-friendly planting this month and some timely tips on Summertime garden tasks, too…. Whilst the more obvious bee and butterfly magnets of lavenders and buddleias are well-known, there are some other shrub varieties that can act as a bee feast, too. The humble Cotoneaster often has an unfair reputation as an also-ran shrub but not if you’re a bee – many varieties have lovely white flowers from Spring onwards, berries in late Summer and superb Autumn colour. Butterflies often prefer a larger flower head, whereas bees are less picky – they are as happy climbing into a foxglove as they are settling on open flowers for their nectar fix. Bees are attracted to blues and yellows (which they see as blue, too!). Honeysuckles are firm favourites for butterflies and moths, too. 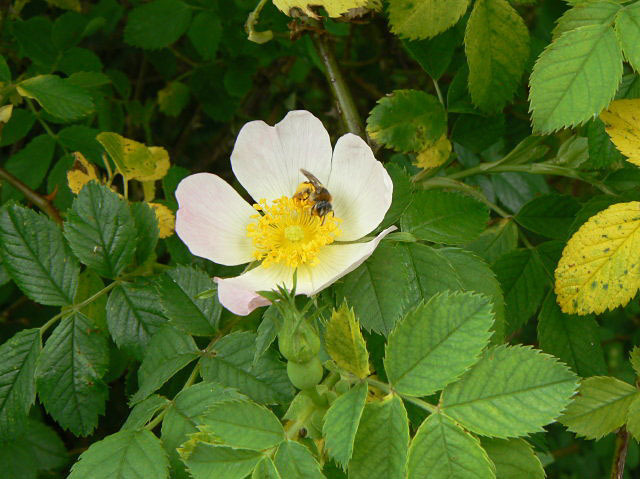 Most natural versions of roses (for example, the Dog Rose, Rosa canina) are simple, elegant and straightforward for bees – five petals, perfectly shaped for bees and arranged to show the centre – where all the bee food is! Arrange your bee-friendly plants in sunny clusters – this will be more attractive than scattering plants or leaving in the shade. Avoid fancy cultivars of plants – they may look beautiful but may lack pollen and nectar, or double flowers may hamper bees and send them on a nectar-less quest. Be sparing with pesticides – they don’t necessarily pose a danger to bees but avoid spraying only flowers and spray in the evening, when bees are less active. Give them their best shot at nectar collection! 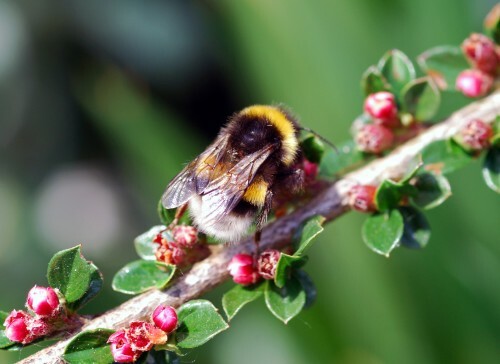 Provide bee-nesting opportunities – bees may nest in hollow stems like bamboo canes or some herbaceous plant stems of between 2-8mm in diameter. You can buy cardboard nest tubes in garden centres or drill your own bee holes in logs or fence posts in full sun. Buzz over to www.treesandhedging.co.uk and browse by flower interest to select your plants with bees in mind. Check tree ties, stakes and guards to make sure that they’re not restricting or damaging the plants and remove any that are no longer needed. Climbing roses finished flowering? Prune and then tie in new shoots, removing dead-heads by cutting the faded bloom just above the leaf joint. Trim hedges, but check for nesting birds before you begin. Leave the hedge cut wider at the base than the top – this not only looks better, it allows maximum light to the whole hedge, keeping it healthy and lush. Pre-order your bare root plants, ready for the Winter – and save 15%.